An Event for the Entire Community! 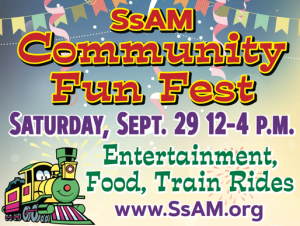 The Episcopal Church of Saints Andrew and Matthew [SsAM] announces COMMUNITY FUN FEST on Saturday, September 29, 2018 from 12 noon to 4pm. Shipley Street from 7th to 8th Streets will be alive with entertainment, music, festivities and food and fun for the whole family. Kids will love the trackless train rides around the block, face painting and balloon animals, make a toy from Home Depot, climb aboard a fire truck, create art with the Delaware Art Museum. For the whole family, join a drumming circle, ride the Smoothie bike, bake sale, Zumba, free selfie wall. And much, much more! There will be exhibits by the DuPont Environmental Center, Habitat for Humanity, New Castle County Community Services, and more. Also on September 29th, SsAM’s next door neighbor and co-sponsor, Christina Cultural Arts Center, will be holding their OPEN HOUSE and Soul of the City Party from 2 to 6 p.m. To learn more about CCAC’s Open House and Party, CLICK HERE! Join us for a chockablock full-of-fun afternoon! And all the fun is FREE! If you would like to volunteer for an hour or more, please contact us.